Adding shower facilities to the three major campgrounds in the Great Smoky Mountains National Park is the most popular upgrade request, but the idea is unfeasible, park officials say. All three -- Elkmont near Gatlinburg, Cades Cove near Townsend and Smokemont near Cherokee, N.C. -- have water in their restrooms but not a sufficient supply for showers or adequate drainage capability. "It's a top request, along with hookups for RVs," park management assistant Bob Miller said. "We've considered it. But it's a question of enough water and gray water (disposed from showers)." To provide showers, the park would have to charge a great deal more for camping, Miller said. 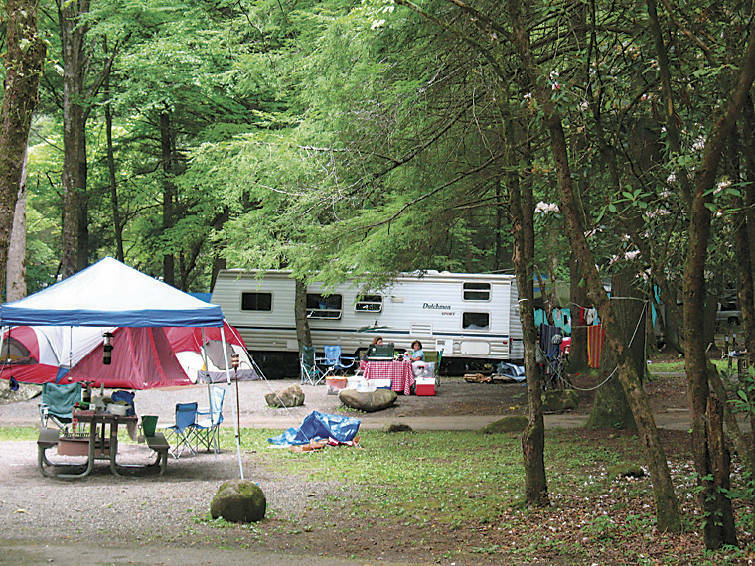 For Smokies campers who don't have self-contained recreational vehicles with storage for their gray water, almost a dozen private campgrounds around the park allow non-guests to use their showers for a fee. In Townsend, for instance, those include Lazy Days (865-448-6061) and Big Meadows (865-448-0625) for $5 per person and Ye Olde Mill (865-448-6681). The nearest campgrounds offering showers to Elkmont campers are in Pigeon Forge, including Alpine (865-428-3285) and Shady Oaks (865-453-3276) for $3 each. Among campgrounds near Smokemont offering showers to outside campers are Bradley's (828-497-6051) and Cherokee (828-498-9838) for $3 each and Happy Holiday (828-497-7250). Park camping was up 11.1 percent for June compared to last year, Miller pointed out, and camping in outlying areas increased 29.1 percent. July through October are usually the most popular camping times. Park officials recently issued an environmental assessment, describing possible resource and visitor impacts, related to improving concession facilities at the Cades Cove campground store. That campground at the entrance to the cove's scenic 11-mile loop road offers bicycle rentals in addition to other amenities. The store was built in 1958, and visitation has greatly increased since then. The assessment considered the impact of making no changes to the existing facilities and another proposal to expand the bicycle building to 1,600 square feet. It would house not only the bikes but some retail stock, vending machines and firewood, but no showers are proposed for it.